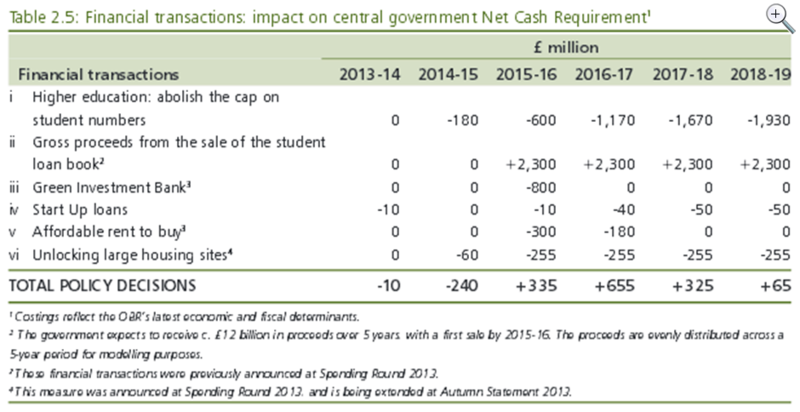 2013 Autumn Statement – is HE expansion fully funded by loan sale? Back in December and January, I discussed here some problems with the figures presented in the 2013 Autumn Statement relating to the sale of student loans and how the gross proceeds would fund the expansion of undergraduate places. The problem was basically that the Treasury used an estimate of gross proceeds, rather than net, and thereby overstated the revenue generated by a sale of loans to the tune of roughly £1.7billion. If you sell loans to the private sector, then the private sector receives the repayments instead of you and you have to reduce your estimated income accordingly. Appearing before the BIS committee in January, David Willetts denied that any ‘schoolboy howlers’ had been committed and promised to set out the proper figures in a written statement. That statement has now been published on the BIS committee website. The two tables there layout what is to be funded by HMT – grants for teaching and maintenance which reach £720m by 2018/19 – and which ‘costs are offset by the planned loan book sale’: those based on new loan outlay to fund an expansion of 60 000 places. I have reproduced Table 2 below. At this point, it is worth recalling that the original Autumn Statement claims were that the loan sale would fund a suite of policies to 2018/19 not just additional loan outlay to 2017/18. But, concentrating only on loans, the new figures are still somewhat misleading. In 2018/19, loan outlay is projected to climb to £1.93bn and the value of loan repayments at that point going to the private sector is estimated at £1bn – significantly exceeding the gross proceeds of £2.3bn. The following year, 2019/20 will be similar: another net impact of -£633m, and we are approaching ‘breakeven’. But 2019/20 is also the year that the sales programme and its proceeds will come to an end, while additional outlay and lower repayments persist: 2020/21 sees £2.93bn of commitments that need to be funded from somewhere else. So let’s extend the new Table provided by Willetts to 2020-21. You could argue that Willetts has overstated the downwards revisions to loan repayments, since much of the changes for the years 2013-14 to 2016-17 are attributable to factors other than repayments being diverted to private hands. But it is worth recognising that the revisions quoted reflect only the changes made between March 2013 and December 2013; the latest figures from the OBR – those that accompanied the March 2014 budget – announce further downwards revisions of £2.5billion perhaps nullifying this whole exercise. The Major Projects Authority rates the sale programme as ‘amber/red’ in terms of delivery confidence and the value of loans to be sold has been written down markedly in the last few months.